Tunisia played England in France '98. English hooligans attacked Tunisians in the streets of Marseille. Algerians came to Tunisians' rescue. Tunisian players celebrate in African Cup of Nations, 2017. I still remember the violent clashes in 1998, between English hooligans and Tunisian football fans, as a genuine act of solidarity between Tunisians, Algerians, Moroccans, and French people of Maghrebi origin. The confrontations took place in Marseille prior to the opening game for Tunisia and England at the World Cup. It was a hot summer and everyone was in the mood for a good game of football. The Tunisian team had an exceptional run at the previous African Cup of Nations in 1996. We reached the final game against South Africa. Even if we lost the game, we were proud of the players’ achievements. Chokri El Ouaer, Zoubeir Baya, and especially Adel Slimi were superheroes of my generation. England’s team had high hopes, too. It was their first major tournament after failing to qualify for the 1994 World Cup. It had a good squad with such good players as Sol Campbell, Alan Shearer, and Paul Scholes. However, there was a feeling in the air in the days before the match that something bad was looming: At home, local newspapers reported that the smug Alan Shearer didn’t know where Tunisia was located. A French journalist documented that 200 to 300 English hooligans gave the Nazi salute and chanted “we are whites and we are proud of it.” Then, news reports on French television started showing uncensored footage of violent confrontations between Tunisian and Algerian fans and drunk English hooligans. During the three-day hostilities, the English hooligans continually cooked up new ways to start brawls on the streets of the city. Tony Blair, then a Prime Minister, was for once right about something; these fans were a “total disgrace.” They fought with police and ended up setting fire to a Tunisian flag. The English media loves to talk about progress in their fight against hooliganism. What happened in Marseille in 1998 and again in 2016 proved them wrong. Drunken English fans will always be violent hoards. Proud Tunisian fans responded with “we are at home,” and they were absolutely right. As hostilities grew, French TV showed scenes of a magnificent solidarity between Tunisians and Algerians. In La Canebière, in the old quarter of Marseille, locals of Maghrebi origin joined forces to fight those hooligans. Tunisians, Algerians, and locals defended themselves and fought them off. It was messy, but it was everything I wanted to see. This was before the internet and before social media, and I had never seen anything like it. It was new, raw and spectacular. Where I come from, a beautiful sense of brotherhood prevades: when you brother is in danger, you defend him first and you ask questions later. “Khawa khawa” (brothers, brothers) is what Algerians always say when they talk about Tunisians. On today’s game against England, 20 years later, there will be a lot of Algerian flags next to Tunisia’s. Ghana didn’t qualify for the World Cup, so which African team do I support? 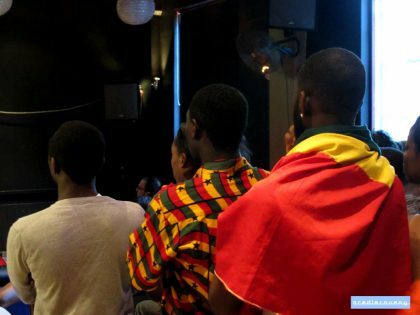 One Ghanaian football fan wrestles with which teams to support in this year’s World Cup after the Black Stars failed to qualify. 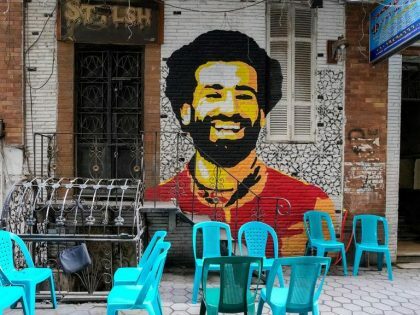 A Canadian immigrant father’s Egyptian football nationalism, and reflections on World Cup fever from Cairo. 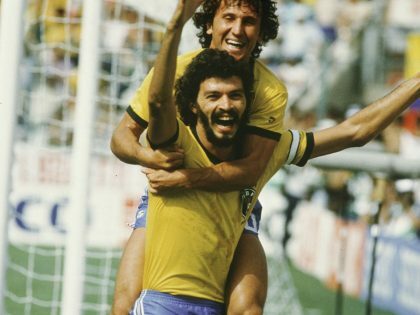 Reliving the epic quarterfinal match between France and Brazil at Mexico ’86. We are exploring the culture and history of the World Cup for the next month while the tournament goes on.